All of our rules are designed for the express safety of our patrons and staff. Please ask for clarification on anything you find unclear. Always keep firearms pointed in a safe direction. Treat all firearms as if they are loaded. Only one person may fire from the shooting stall at a time. Be certain that your firearm is in proper working condition. NEVER cross the firing line. If a “CEASE FIRE” is called you are to stop shooting immediately, place firearm on bench and back away from firing line. Eye and ear protection must be worn upon entry to and at all times in range. Smoking, chewing tobacco, e-cigarette, drug and alcohol use is strictly prohibited. Food and beverage in the range area is strictly prohibited. Report all accidental discharges, misfires, or malfunctions immediately to the Range Staff, keep firearm pointed down range at all times. Handgun caliber ammunition not to exceed 2,000 feet per second, no caliber over 44 magnum. No armor piercing or steel core ammunition allowed, if found using unapproved ammunition you will be charged $200 and be permanently banned from the facility and subject to legal action. Rifle rated ammunition not to exceed 3,200 feet per second, no armor piercing, tracer, incendiary or steel core ammunition allowed. If found using unapproved ammunition you will be charged $200 and be permanently banned from the facility and subject to legal action. Clean your lane after you are finished shooting, including the removal of your target. All down range and abandoned brass belongs to T-Rex Arms, LLC of Belleville. 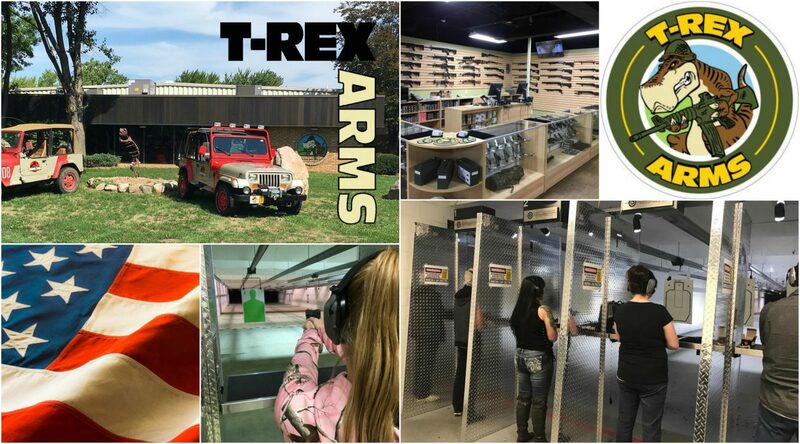 No drawing from a holster until you have passed T-Rex Arms, LLC’s Defensive Pistol Certification Course. Do not exchange firearms with another lane. Switch shooters, not firearms. No refunds of any kind for parties expelled from the range for safety violations. All Range Staff are in direct charge of the range and all participants at all times. All range rules and regulations must be adhered to at all times. No more than two shooters are allowed per lane. All ammunition, magazines, and firearms are subject to inspection by range staff at any time. No rapid-fire is permitted. Allow at least one second between shots. All shooters are under continuous video surveillance. Damage to any part of range including baffles, lighting, target carts, target hangers etc., due to negligence of the customer, will result in customer paying for the damage. $20.00 fee per hit will be charged for shooting the ceiling baffles or concrete walls. Any questions please ask Range Staff member!